France were crowned the new world football champions in the summer. Croatia were the runners up. The interesting question, then – can we confidently say Croatia was the second best team in the tournament? 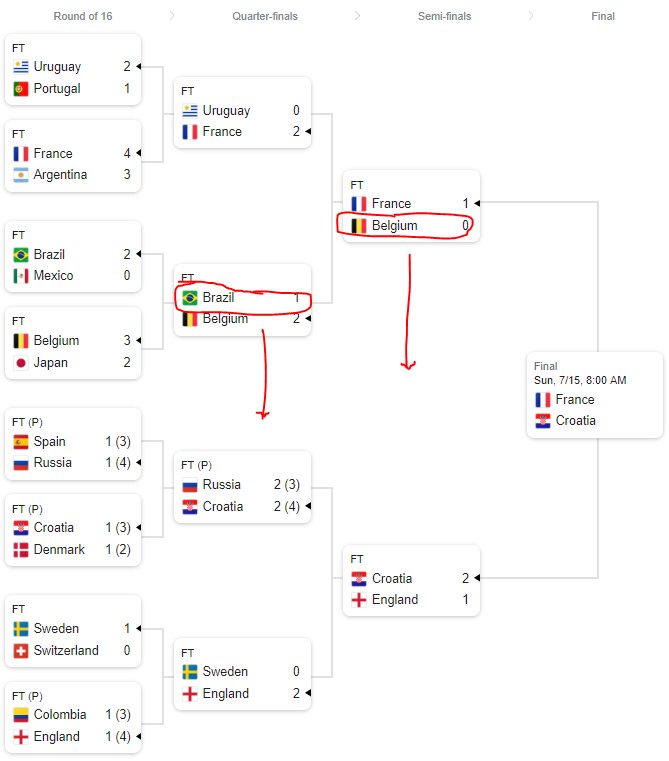 Would they have beaten Belgium or Brazil if either team had been in their half of the bracket? While it is likely to be just a battle of your opinion versus mine, I’d hazard a guess that Belgium and Brazil were probably better teams. The challenge is that elimination via brackets does a good job identifying the winner. But, it does a poor job of finding second place. The best approach to finding the stack rank of the teams would be to do a comprehensive round robin where everyone plays each other – equivalent to the English Premier League for example. But, we don’t have time for that in the world cup. So, brackets are the way to go. In Computer Science, a sorting algorithm puts the elements of a list in a certain order. Computers, in many ways, are just sorting machines. They take vasts amounts of data and find ways to sort them intelligently and make them available when we need them. The efficacy of sorting algorithms is judged by the big O notation. It is the worst case scenario of time taken to sort “n” items. The first sorting aglorithms had a worst case performance of N^2 square. This means the performance gets really bad as the number of items increases. As a result, sorting and, by extension, computation was very expensive. This was until the Merge sort came along. Merge sort is what you do when you split a large pile of laundry, split it into little piles, sort those piles, and then merge them together. The process of elimination in competitions via brackets is, thus, a variant of merge sort. As Brian Christian and Tom Griffiths share in their book “Algorithms to Live By,” there are plenty of other such life applications of sorting. For example, sorting theory teaches us to never sort email into folders if searching is easy. Sorting is expensive (read: giant waste of time). Sorting theory also teaches us to use “bucket sort” when possible. Bucket sort or bin sort is what you do when you just separate your laundry into various “bins.” Assuming a small number of bins, it gets sorting done in linear time. We also see sorting theory play out in every organization via the pecking order. Pecking order was first observed in a brood of chickens who figure out their leadership order by pecking away at each other. The most powerful peckers are higher up in the order. Humans do it too – it is called politics and usually just requires two humans, a room, and some incentives. Okay, so what does all this have to do with technology and the future? The power of Google is not just in the searching but in its ability to do the sorting. In fact, we could make the argument that it is the efficacy of their sorting algorithm that makes Google the massive money making machine that it is. 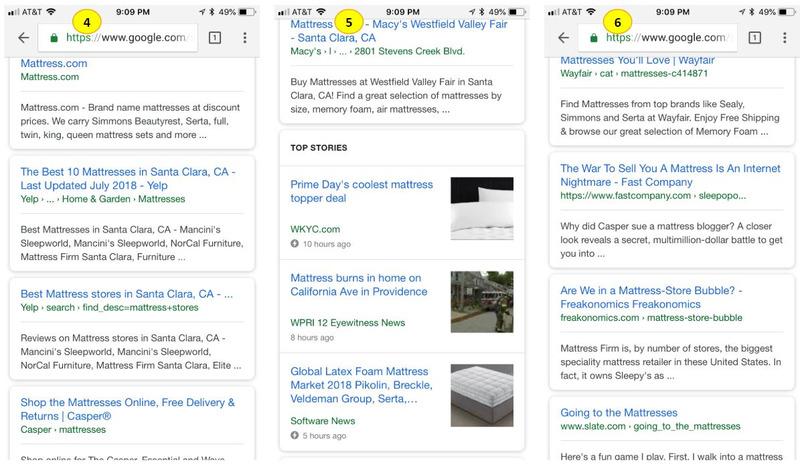 Google rose to power sorting results into pages with 10 relevant results. Over time, they added ads to the side and then on top and became one of the most valuable companies on the planet. Let’s take a look at what Google’s sorting looks like right now. 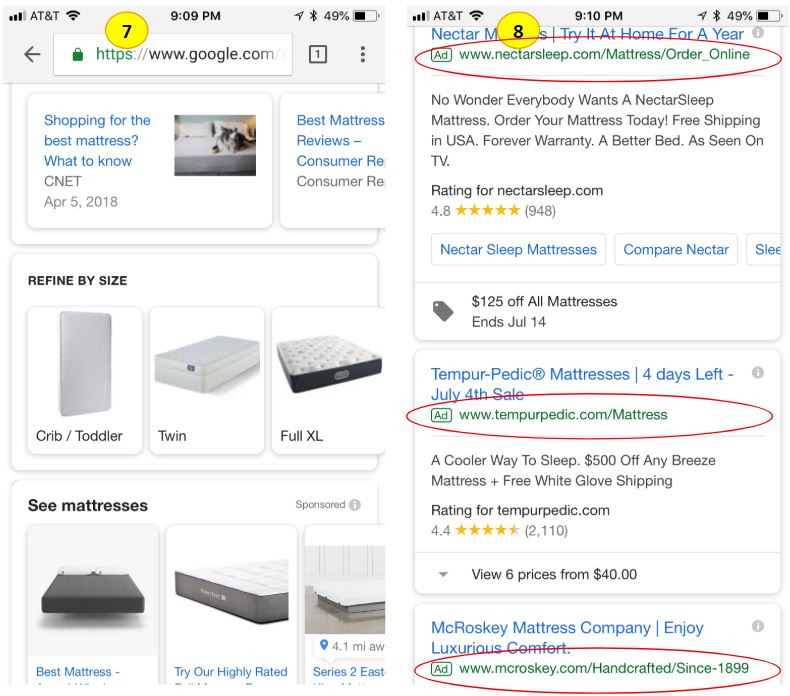 These are screenshots as I scroll down for a search for “mattress” – I’ve captured 8 screenshots from beginning to end and I’ve encircled the ads in red. 1. It took me 2 entire screen scrolls before I saw the first completely organic result. 2. I counted roughly 16 organic results/groups and 7 ads. 3. I don’t think I ever scroll past screen 2 – my guess is that I’m not the exception here. Google, then, is still a sort engine. For most retail searches, however, it just sorts more ads these days than organic results. Who gets to do the sorting for you? There are two lucrative marketplaces on the internet – attention marketplaces and retail marketplaces. The biggest leading indicator for the success of a marketplace is whether or not they do the sorting for you. If Facebook gets to sort the information you see through the course of a day (and, for a majority of the world’s adults, they do), the attention marketplace is theirs. 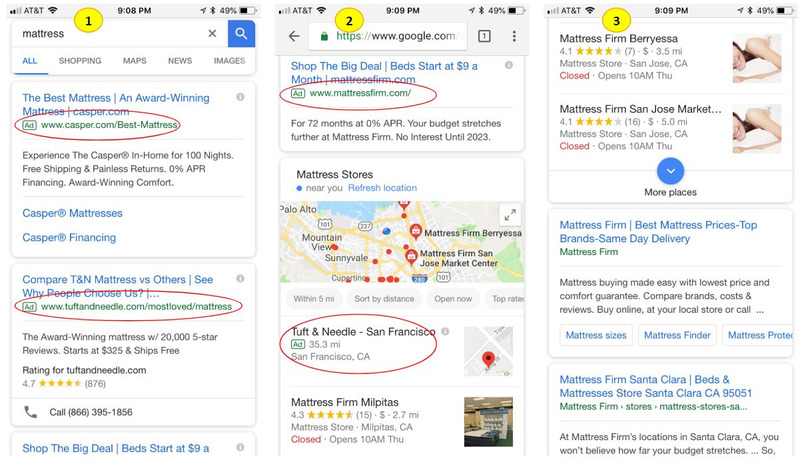 And, if Google gets to sort the results of your retail searches, then they win big as well. Understanding this truth about sorting explains a lot about the state of the big technology players today. Facebook – including Instagram, Whatsapp, et al – sorts the information the world sees every day. But, they’re working hard to invest in video because they don’t want Netflix and YouTube to sort what you watch. The New York Times homepage used to be the most prestigious display of sorting two decades ago. It isn’t anymore. Old world publishers are, thus, falling by the wayside. The smarter ones are realizing that the only place they can do the sorting of information for their users is email. So, they’re doubling down on email and building subscription businesses on that (quaint?) piece of technology. Disney, 21st Century Fox, and the like don’t want Netflix to sort the shows you want to watch. They’re scrambling. So are large telcos who’re finding ways to get in on this action. Google, on the other hand, is targeting a different kind of foe. Google makes a lot of money off retail searches. But, increasingly, people are starting their retail searches on Amazon. Worse still, they’re able to do so by just talking to Alexa. From a monetization standpoint, that is an existential threat for Google. Google’s $550M in Chinese retailer JD.com is just the tip of the iceberg for Google’s marketplace ambitions. Expect plenty more to follow. One thing is for certain – In all these moves and the many more to come in the future, sorting will be omnipresent. I find myself reflecting frequently about the number of times I say no to our ~2 year old. It is the easy default response to the things she wants to do – explore away by turning everything upside down without any regard for her own safety. After months of attempting to strike the balance, I’ve recently found a better approach that’s helped me make peace with this process. Now, I ask myself – Am I saying no because it is dangerous for her (e.g. playing with something very heavy or hot) or because it is inconvenient for me (e.g. something that will result in a mess that I need to clean up)? And, when the answer is the latter, I do my best to stay silent. To learn and not to do is not to learn. Implication: if we’re not continuously experimenting with and evolving how we approach our work and lives, we’re likely not learning. There’s been a massive war of words between a few current and former Facebook billionaires that’s commanded a ton of media attention in the last few days. I get that they’re attempting to prove their ideologies and actions right. As Yuval Harari might say, we have a strong need to believe in our own myths. But, it just comes across as childish and petty while also proving that having plenty of wealth does not guarantee happiness. Far from it. As they continue to snipe and call each other names, I find myself wishing they’d switch the focus of their fight to an arbitrary topic (any topic, really!) that actually matters – how to better use their billions to help people whose lives are impacted by the very technologies that made them rich or how we can do better to tackle climate change. We need more attention on that stuff. Packet switching, on the other hand, breaks communication into packets that reach a destination without worrying about busy lines. While phone lines used to be either free or busy, our destinations today (email accounts, social media accounts, phone inbox) deal with packets all day along. There is no concept of idle time since people and services send us packets through the day and wait for us to acknowledge them. Consequently, idle time has disappeared in our lives too. The constant presence of packets means we check our phones in the bathroom or when others are trying to communicate with us (the irony) in a generally futile attempt to be packet-zero. While packet switching has its many benefits, its curse is that it is built to serve the communication system and not us. There’s a Tahitian saying that tourists have watches but Tahitians have time. While we can definitely look at packet switching as a cause for that, there’s also a deeper implication. If we don’t take control of how we consume and respond to these packets, we’ll be surrounded by communication – but will have forgotten how to communicate. Our work won’t speak for itself. Our work won’t speak for itself. On a good day, it may just do 70% of the talking required. But, it still needs us to make the effort to package it and make the case for it. But, it bears repeating – it won’t speak for itself. And, even if we build it well, they may not come. In fact, unless we put in the effort to sell it, they most likely won’t. A useful assumption, then, is that quality work will do half the talking. The rest is up to us. The world and the places we work seem fairer places once we internalize that and do the work to make sure our efforts count – after we do the work.